The 52nd legislature of the Student Government Association (SGA) violated the Finance Code by placing a bill that proposes changing the Student Activity Fee (SAF) distribution on Monday’s daily agenda without first publicizing it to all undergraduate students. SGA’s chaotic Monday night meeting was not a formal legislative session because they failed to reach quorum, but the legislature discussed two bills: one that would redirect more of Goizueta Business School students’ SAF to BBA Council and another that would fund $500 toward puppies for Goizueta Week. Several members of the previous SGA, including former SGA President Gurbani Singh (18B) and former Speaker of the Legislature and Senior Representative William Palmer (18C), objected to the bills and expressed concerns about the new legislature’s procedures. 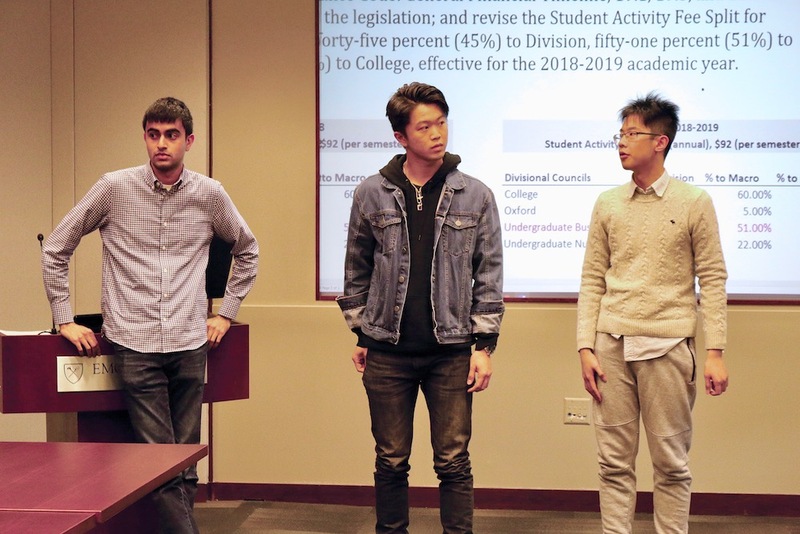 Despite lacking quorum, SGA heard Bill 52sl2, which would change how the the SAF is distributed by increasing the amount of money BBA Council receives from the SAF Fee Split at the expense of College Council (CC) funding. However, an announcement to all undergraduate students must be made before a bill changing the SAF split budget can be passed in two consecutive legislative sessions, according to the SGA Code of Finance. The bill came in wake of SGA President Dwight Ma’s (17Ox, 19B) questionable veto of the 2018-2019 SGA budgets, which was passed by the previous SGA legislature on April 3. Singh and Palmer both said that Ma was not allowed to veto the 2018-2019 budget, and Singh said Bill 52sl2 could only be applied for the 2019-2020 SAF budget. The 51st legislature sets the next legislature’s operational and administrative budgets, according to the Code of Finance. Bill 52sl2 would alter the undergraduate Business School’s SAF split amounts from 34 percent to 45 percent toward BBA Council; 52 percent to 51 percent toward SGA essential accounts; and 14 percent to 4 percent toward CC. The changes would take effect for the 2018-2019 SAF split. Krishnaswamy told the Wheel on Tuesday that he planned to remove the bill after several students voiced concerns at Monday’s meeting until the issue of Ma’s veto is resolved. SGA’s operating budget is funded by undergraduate students’ $92 per semester SAF. SGA distributes SAF funds to undergraduate divisional councils, executive agencies and UWOs through the Fee Split. The bill states that the current allocation was determined based on the fact that BBA students participate in CC clubs, but “a recent audit estimated that 35 percent of all members of BBA clubs are pre-BBA students. However, these pre-BBA students’ student activity fees are distributed between only the college and university-wide funds, and not to the Business School,” according to the bill. The audit was conducted by the BBA Council, Krishnaswamy said. BBA Council receives $60,000 per year from the SAF; $49,000 is allocated to Kegs, a weekly Business School event that involves food and networking opportunities, Palmer told the Wheel. The bill would suspend the General Financial Timeline and sections 19.1, 19.3 and 21.3 of the Finance Code. The General Financial Timeline states that changes to the SGA Fee Split for the following fiscal year must happen by Dec. 31 of the current fiscal year. Any Fee Split changes that occur after Dec. 31 will take effect after two fiscal years. Bill 52sl2 attempts to suspend this portion of the timeline. Section 19.1 of the Code of Finance states that SGA legislature must submit changes to the SGA Fee Split at least 30 days before the operational budget requests are due to the SGA VP of finance if changes want to be implemented for the following fiscal year. There are more pre-BBA students than there are BBA students due to some pre-BBA students not being accepted or deciding not to apply to the Business School, Spitzer said. “If you actually look at the numbers, it makes mores sense that [CC] should allocate to the Business School … rather than the other way around,” Spitzer said. When former SGA Attorney General Elias Neibart (20C) informed Krishnaswamy that bills cannot “suspend” the Finance Code, Krishnaswamy said that no SGA documents state that the Finance Code cannot be suspended. Neibart also said SGA operational budgets for the 2018-2019 school year were voted on by the 51st SGA legislature and cannot be changed. SGA is currently operating without an attorney general. Palmer expressed concern over the audit mentioned in the bill and about the attendance makeup of BBA clubs. When Spitzer clarified that Krishnaswamy meant there are more pre-BBA students in BBA clubs than there are BBA students in College clubs, Palmer said he does not believe there is data behind that statement. Krishnaswamy said he did not present the audit during Monday’s meeting because the meeting was not an official legislative session. BBA Council has performed audits for the past two years, according to Krishnaswamy. He said he planned on presenting the information during a public hearing. Krishnaswamy also said that BBA Council has asked CC for data on the number of BBA students in College clubs “for a long time” but has heard no response. Former CC Junior Legislator Tiffany Haas (19C) said at the meeting that CC had not received any communication from BBA Council regarding an audit. Haas recommended that Krishnaswamy directly contact CC “instead of attempting to blindside them” at a meeting. Krishnaswamy also presented Bill 52sl1, which funds $500 to rent puppies for Goizueta Week. Goizueta Week, which hosts spirit and de-stressor events, is scheduled for next week. Krishnaswamy said that the $500 request is being made because the BBA Council chartered and granted funding to the Goizueta Black Student Association this year. After funding the group, the Council could no longer afford to continue funding its regularly planned events and other clubs without additional support. The $500 that Krishnaswamy is requesting would cover 15 percent of Goizueta Week costs, which he estimated to be about $10,000. Singh said a legislature cannot vote on funding that is “three years out” and affects the budgets of future legislatures. Krishnaswamy said the clause “to fund Goizueta Week for a period of three years” was a last minute addition to the bill and should be removed. Singh encouraged Krishnaswamy to further discuss the state of student government finances with former SGA Vice President of Finance Javi Reyes (18B). “If you continue to spend money now, we’re only burning money that is supposed to be our safety net for the next legislators,” Palmer said, adding that legislators should be “very strict” about allocating funds for the next year. When former Freshman Representative Austin Graham (21C) expressed concerns over the bill being presented a week before the event, Krishnaswamy stated that BBA Council struggled with funding because they only received 34 percent of the Student Activities Fee (SAF) and could only fund two chartered organizations. Krishnaswamy apologized for presenting the bill a week before but emphasized that no other BBA Council representative has come to SGA for funding recently. Graham emphasized that “[SGA] has to draw the line somewhere” and told Krishnaswamy that “as [business school students], [Krishnaswamy and the BBA Council] should have budgeted more effectively for the year … it’s not our fault and I see no obligation of the legislature to fund something that you should’ve had in your budget to begin with,” Graham said. Sophomore Representative Zion Kidd (21C) told the Wheel that he felt the bills were “very rushed” and “lacked enough research” for discussion. Sophomore Representative Lori Steffel (21C) told the Wheel that she is a pre-BBA student and has seen “the extreme lengths” students go to receive funding for BBA clubs. Steffel “sympathizes” with BBA Council’s efforts to change their funding and with SGA’s efforts to “respect the rules.” Steffel does not believe SGA can change the undergraduate Business School’s SAF for the 2018-2019 school year. SGA Executive Vice President John Priddy (20C) told the Wheel that the bills need “a lot of work” and does not believe that the Code of Finance can be suspended. SGA did not reach quorum because there are multiple elected positions that have not been filled. To reach quorum, positions that were not filled because no one ran for them must be appointed by Ma, who must present his nominations 24 hours prior to the SGA meeting time. Ma failed to do so. The legislature approved Junior Representative Johnson Wang (20C) as the acting speaker of the legislature, but the vote was invalid because they did not have quorum. An official meeting can not be conducted if SGA does not reach a quorum of two-thirds of legislators present. SGA Junior Representative Johnson Wang (20C) served as acting speaker of the legislator. Ma said that as no current legislator present had previous SGA experience, the position of speaker of the legislature went to the oldest legislator. Wang said he was unaware that he would be speaker until an hour before the meeting. 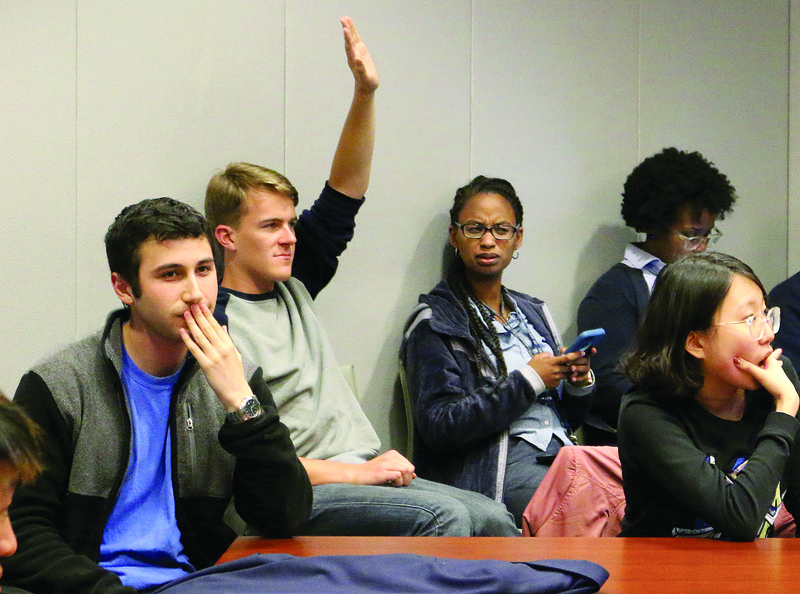 According to Spitzer, SGA does not need quorum to appoint officials. Ma said appointed positions would be confirmed next week. Correction (4/18/18 at 10:53 a.m.): An earlier version of this article stated that BBA Council President Jay Krishnaswamy (16Ox, 19B) estimated the total costs of Goizueta Week to be $3,333. Krishnaswamy clarified to the Wheel after this article’s publication that about $3,333 of Goizueta Week is covered by BBA Council but the total costs amount to about $10,000.